When we bought our house a few years ago, we agreed to remodel the inside (which was many years overdue), and wait on painting the outside and replacing the 20-year-old roof… which was still in “good enough shape” according to my husband. Finally, we are ready to have the outside painted, but we’ve been going back and forth on the color for weeks. The current color of the house is chocolate brown. This color was very appropriate color for when it was built in 1975, but now it looks tired and dated. I wanted something a little more contemporary. 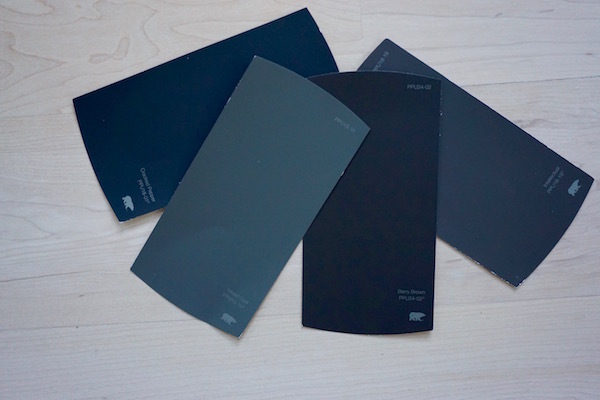 Due to the style of the house, it needs to continue to be a deep, dark color. So we decided on something in the charcoal grey family. Unfortunately, we just couldn’t find the right shade. Everything was too blue or too light and it wasn’t in keeping with the style of the house. We tried a half dozen different colors ranging from a deep tan to almost black. My husband vetoed everything until we settled upon a greyish-brown. Something called “Mocha Berry.” He then left for a business trip on the east coast. The painter came on Saturday and by Saturday afternoon, when I saw the first coat painted on one of the exterior walls, I had a mild heart attack. It was basically a richer (darker) version of the brown house that I have been waiting to get rid of for years. So Saturday night at 8pm, I found myself at Home Depot talking to the “paint guy” explaining my dilemma. I explained that my husband and I agreed on this one color, but when the sunlight hit it, it looked completely different and now I am in a panic. With my husband out of town and the painter due to come back at 7am on Sunday morning, I needed to provide a viable alternative first thing in the morning… before more time and money was spent on the “wrong” color. I had my husband on the phone while I was having this conversation with the Home Depot “paint specialist” (marital counselor). I really don’t think he completely understood the gravity of the situation, but he was very patient with me as we went through every version of grey that they carried in the store. I found two new slate greys (one was more of a charcoal grey) and I was ready to meet the painter at 7am on Sunday with two sample-size quarts in my hand. I introduced myself. (I had not met him yet because my husband had been dealing with him directly.) Then I promptly apologized for asking him to stop painting and try these two samples on another wall. I think the painter knew that he was in the middle of a potential marital upset. This isn’t really about paint. It’s about communication. Compromise. Coming to an agreement and then throwing a wrench in that agreement when someone is out of town and not there to defend their position. It’s also about waste. Time and money. But the painter recognized that I was in a full blown panic and he helped me settle upon the darker (more charcoal) grey. He agreed that in the sunlight, the other color we had “chosen” (dare I say “compromised” on) was too brown. And that this new color was an improvement. I then called my husband (who was five time zones away) and tried to explain why I was making this executive decision (which included me racing back to Home Depot and picking up 10 gallons of paint so that the painter could get started.) My husband was not pleased. He liked the color we picked. He didn’t want it to be too grey. Why was I making this decision now? Why didn’t I do all my second guessing weeks ago? I don’t know, because paint looks different from a chip to a wall. In fact, this paint looks completely different in the shade as it does in the sunlight. How was I to know that his Mocha Berry was going to look like a bad cup of coffee and I needed a Charcoal Grey to give it more life and a fresh new look? Unfortunately (or fortunately?) our painter has a day job. So he can only paint on the weekends, which means he could only paint a portion of the house on Sunday. He will be back next weekend to do the rest. This is good news because my husband will be back and he can do his own compare and contrast of the two colors before we finish the job. The bad news is this morning when I went to examine the two different colors, my husband’s color didn’t look so bad after all. In fact, it looked kind of rich and awesome in the morning light. I started to panic again. What if my “freak out” about the “brown” paint was my imagination and maybe, after two trips to Home Depot at ungodly hours, I am the one who made the mistake to stop painting the first color that was actually the “right” color? I take a deep breath and remember that I need to wait until the afternoon light shines on the “brown” to make a clear determination of what’s best. Finally, the afternoon sun came out and I could examine the two colors side by side. Much to my dismay, neither color was right. The Mocha Berry was simply too brown… and the Charcoal Grey was too harsh. Needless to say, when my husband returns from his business trip, I think we are going to have to go back to see the “martial counselor” at the Home Depot paint counter.